WARNING! Hydrogen peroxide (H2O2) is a strong oxidizer and corrosive at the concentrations mentioned below. Using hydrogen peroxide via the methods laid out on this page can cause the death of your corals and livestock. It can also cause damage to you personally, including severve burns and blindness. You should never use H202 near children or pets.​ These methods should only be carried out by professional reef keepers who wear the proper protective equipment and understand the risks. You assume all liability. Today I wanted to talk about killing algae inside a reef jar. 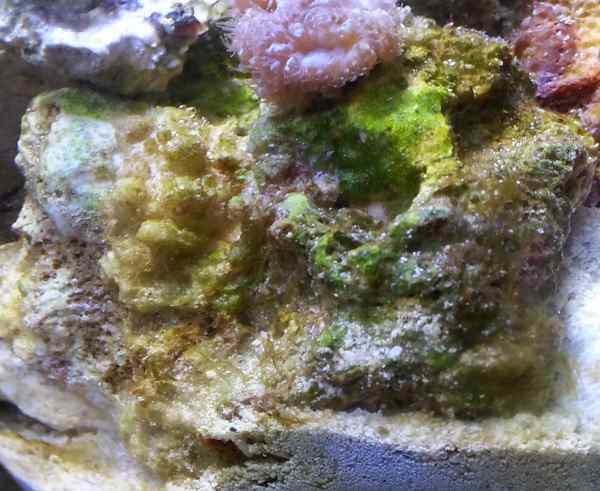 Red, purple, and pink coralline algae are desired by many and typically harmless. However there are various strains of red, brown, and green algae and bacteria that are not. These can grow everywhere and ultimately cause corals to die by asphyxiation, starvation, shading from light or all 3 combined. So how do we get rid of it? Traditionally, larger systems employ all types of chemicals and invertebrates to eliminate, or at least keep under control, their algae problems. But this is not practical, nor needed, in a reef jar. Using chemicals means the potential to over dose or adding expensive equipment. If we followed this route, pretty soon our jar and/or vase would become a big mess of hoses, filters, pumps, and containers. Using snails and crabs to eat algae creates other problems such as limited food supply which could lead to their death and pollute the environment and the potential to knock over and/or destroy corals. Because we employ 100% weekly water changes, especially after feeding, it helps reduce the amount of nutrients from decaying waste and detritus that algae thrives on. However, algae can grow in pristine conditions. It’s not easy to get rid of as one might think. The long term goal is to build out your corals to the point where algae can't compete with them for light, space and nutrients. But getting to this point takes time and elbow grease. The following pictures are from one 5 minute treatment. In the "after" picture you can see I moved the pink blastos to the right and another blasto frag was moved down in the top left. How do we kill algae in a small saltwater aquarium? Simple, with a little H202 therapy! TIP: It’s important to keep on top of any developing problems. While we can “restart” our pico reefs in a matter of hours, in the long term you’re better off spending a few minutes each week cleaning and maintaining before things get out of control. SAFETY FIRST: Hydrogen peroxide (H2O2) is strong oxidizer and should be handled with care. It is also corrosive. Please see your MSDS for proper handling recommendations (i.e. goggles, gloves, long sleeves). When buying 35% it should come with an MSDS sheet. If not, ask for one. In some states or provinces you may need a license to purchase it. It’s that dangerous! Without getting too technical, a chemical reaction forms when hydrogen peroxide interacts with certain materials, chemicals, and organics. The result of the reaction destroys things on a cellular level. This is exactly what we need to kill algae quickly. The chemical reaction may make your rocks fizz and foam. Don’t worry, it won't set your rocks on fire… at least it shouldn’t. In case you can't find 35%, your local pharmacy will have a 3% topical solution for cleaning wounds and cuts. You can experiment with 3%, but it may not be effective at all in some cases. And 35% may be overkill, but it ensures that our target is eliminated. It will also kill your corals and other livestock if you aren't careful enough. It’s important to note that once algae has been successfully eliminated from one spot, it doesn’t guarantee that it won’t grow back in that spot in the future. keeping on top of it will ensure that it doesn’t get a good foot hold again. There are two ways to kill algae on rocks. Picture is advanced technique of removing algae from a Blastomussa frag. Note: don't get too close to the coral, peroxide will travel "up hill" by way of capillary action and kill the coral. This is my preferred method for live rock in general. 1. Remove the rock from the jar. 2. 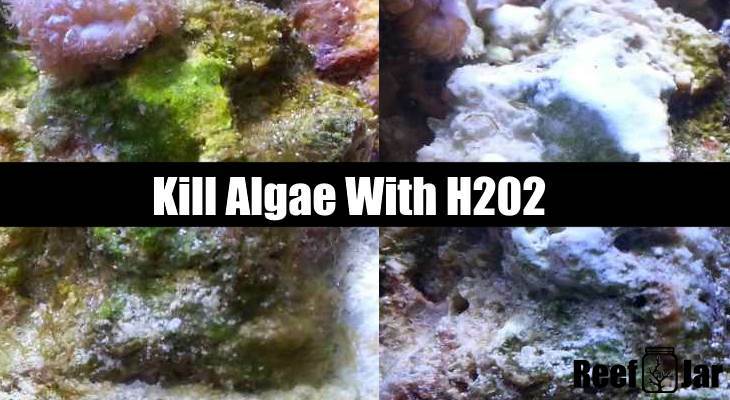 Apply hydrogen peroxide to the algae. I like to use a paint brush that is “almost” dripping. Alternatively, you could use an eye dropper or cue tip to apply the H202. The most important thing is to not allow hydrogen peroxide to contact any corals or life that is not algae. Try not to let it drip in to areas of the rock that don’t need peroxide. If you do, you may notice critters like bristle worms come fleeing out of your rock as they are being burned alive. 3. Let the algae “bake” for 5 - 10 minutes. I recommend you start with 5 minutes. If you notice the algae on the rock doesn’t change or die before the next water change, then add more time in the future when you tackle the area again. 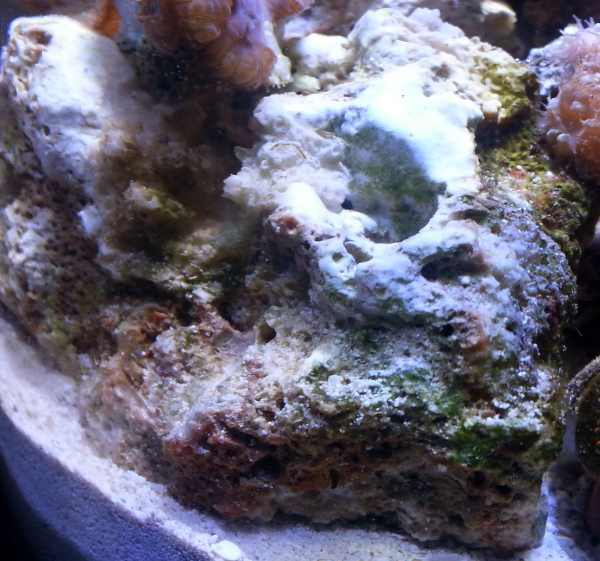 If you have corals on the rock, don't worry about them being exposed to the air unless it's a sponge. Most corals have adapted for those conditions when tides come and go. 4. Rinse the rock with fresh saltwater and put it back in your jar. Be generous with rinsing. 5. You could use a toothbrush to remove any loose baked algae and then rinse again. You should never brush the area while H202 is on the rock (you could get splattered and/or severely burned). If you plan on treating multiple rocks, it may be better to rinse your rocks and then soak them in a bucket of fresh saltwater before adding back in to your jar. You can never be too cautious when it comes to ensuring that hydrogen peroxide isn’t remaining on your rocks which could alter the chemistry inside your jar and kill the inhabitants. 1. Siphon out all water from the jar. Move corals out of the way if possible. 2. Spot treat the algae with H202. Using a small paint brush works well to hold just enough hydrogen peroxide and control where it goes. Just make sure the brush isn’t dripping everywhere. It should never drip. It should only come off when brushed gently. 3. Let it the algae “bake” for 5 - 10 minutes. I recommend you start with 5 minutes. You should notice a significant difference over the next 24-48 hours. If not, add more time in the future when you tackle the area again. 4. Fill the jar with fresh saltwater, siphon it out and discard it. 5. Refill the jar with fresh saltwater and keep an eye on everything. Your corals should start to open back up within 30 minutes to an hour. You may notice the treated area, the algae and rock, go completely white within hours. This is the bleaching effect of H202. Tougher algae may slowly change colour and fade away over the course of a day or two. Either way, you should notice something happening fairly quickly. I use a BettaMag glass magnet to keep the glass in check. If it seems like a constant battle, using h202 may be the key. 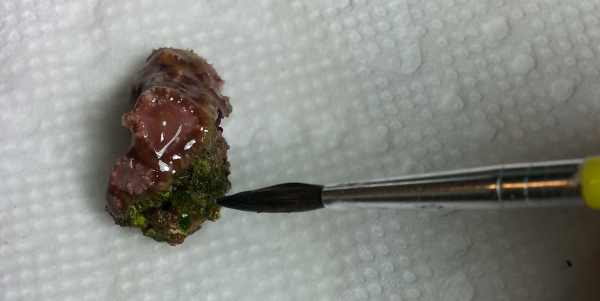 This works for removing coralline algae too. For cleaning the glass, I recommend you stick to the worst areas only until you get a handle on cleaning without dropping or knocking things over. You also don’t want too much H202 getting in to the system at any given time. It’s better to clean a little here and there, than a lot all at once. 1. Siphon the water out of the jar. 2. While wearing latex gloves, fold a paper towel small so that it would be hidden in your palm if you closed your fist. This is so that you have full control of it. If a piece of paper towel with H202 on it was dropped or touched a coral even for a split second, it will burn it. 3. Apply a small amount of peroxide so that a small section of the paper towel is moist on one side, not dripping. You don’t want H202 making your gloves wet either. 4. Wipe or dab the glass where the algae is growing and let it “bake” for 2-5 minutes. You may or may not notice some foaming and fizzing. If you don’t, don’t worry it’s still working. 5. Get a new paper towel, drench it in RO water, ring it out well and give the glass a good wipe to help remove some algae and H202. The less stuff left to decay in the jar the better. 6. Fill the jar with new saltwater, siphon it out to remove any remaining H202 and discard the water. 7. Fill with new saltwater and enjoy the clean glass. ​I have big hands so sometimes I will use a pair of long forceps to hold the paper towel. It's a bit more tedious as you don't want to scratch the glass, nor lose control of the corrosive paper towel. If you weren’t able to wipe the algae off, don’t panic. 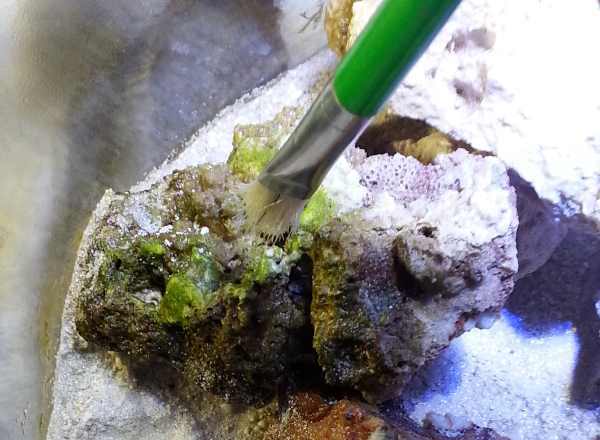 Just like when cleaning rocks, the algae will probably turn a different colour over the next 24 hours and start to disappear from the area that you baked. At that point you could then use a small magnet cleaner to remove it from the glass. Never add hydrogen peroxide to your jar or vase while it is full of water. This will cause extreme stress to the inhabitants and most likely death. Hydrogen peroxide should only be applied to a specific area when the jar has been drained or to an item once it has been removed from the jar. With either of the methods, I recommend that you treat a small area only. This is to help prevent too much H202 from accidentally getting in to your system should your rinsing and flush not be enough. Remember, a little goes a long way! Do not let a single drop of H202 go anywhere that you do not intend. I hate to sound like a broken record, but 35% hydrogen peroxide is a dangerous chemical. It can and will severely burn you, your family, children, pets, neighbor, etc... It doesn't discriminate on who it affects. It could cause blindness, serious injury, and possibly death. Using H202 for killing algae is not for everyone. Let me know in the comments below if you've used hydrogen peroxide to kill algae and how it's worked for you.